Wallace Brown also leads much of the Houston’s transportation and community planning efforts, including the Mayor’s signature Complete Communities Initiative. The position also includes oversight of many of the City’s geographic mapping efforts. Acting Director Wallace Brown serves as a non-voting member of the City’s Planning Commission and the Houston Archaeological and Historical Commission. During her thirty-two year tenure in the City’s Planning Department, Wallace Brown has participated in a diverse array of projects that have had a profound effect on Houston. In the 1990s she oversaw the creation of Houston’s first visioning process, Imagine Houston. In 2010, she managed the City’s U. S. Census Complete Count effort that brought additional Federal funding and representation into the city. In 2011 she led the city’s landmark redistricting process that increased the number of City Council members from 9 to 11. 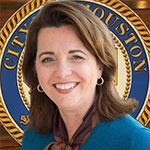 In 2015, she provided leadership to the creation of Houston’s first General Plan, Plan Houston. In addition, she has overseen numerous city limit expansions and annexations through utilizing Strategic Partnership Agreements, a program that taps into a revenue source that now equals seven percent of all City sales tax collections. While most of her City tenure is policy-related, Wallace Brown began her career as an interiors architect for Interfin Corporation after obtaining a Bachelor of Science degree in Architecture from the University of Houston. She also holds a Charrette System Certification from the National Charrette Institute, holds accreditation from the Congress for New Urbanism and is a Certified Public Manager from Sam Houston State University Continuing Education. In addition, she has held leadership positions with the American Institute of Architects, Houston; the American Planning Association; the Bellaire Nature Discovery Center; West University Elementary and St. Pius X High Schools; Chi Omega Fraternity; and the Junior League of Houston.